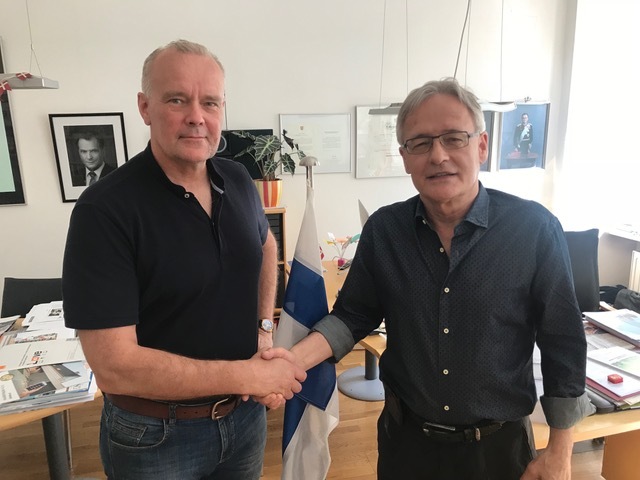 On 24.05.2018 Johan Wasberg, development manager from our partner cluster Merinova from Vaasa in Finland visited SPCleantech. During the meeting in Krakow further cooperation and participation in common projects in Baltic Sea Region Innovation Express and others were discussed and agreed on. Merinova which is the leading cluster in energy technology in the Nordic region and an engine for Finnish exports is made up of 140 companies in the industry, many of which are global market leaders of their niche. A total of 11,000 people are employed by the companies, which have a combined turnover of 4.4 billion euros. 80 percent of sales come from exports, and it’s these exports that are so significant, because they account for 30 percent of Finland’s total exports in energy technology. Merinova is also known for its extensive investments in research and development, which has tripled in recent years. Meanwhile, the staff who work with research and development has doubled. From Merinova’s initiative back in 2001, EnergyVaasa began its operations. The driving force was primarily Merinova Board members Heikki Miilumäki (Wärtsilä), Juhani Pylkkänen (ABB) and Jorma Pitkämäki (Vaasa city). EnergyVaasa’s objective was to establish contacts with such decision making bodies in Vaasa, which at the time were not Merinova’s owners. When EnergyVaasa was founded, it was expressly companies belonging to the group. The group’s idea was to come up with new ideas for the OSKE programme and create different types of energy demos in Vaasa. Among these projects are a small wind power demonstration by the roundabout at Farmarevägen and Ladugårdsvägen, some small wind turbines at the University of Vaasa and an electric car at Technobothnia.